WELCOME TO THE FRINGE SHOP! HERE YOU WILL FIND EVERYTHING I HAVE TO OFFER AS FAR AS MY FRINGE LINE GOES. SO WHAT IS A FRINGE? BASICALLY IT'S A ONE PIECE WIDE CLIP IN EXTENSION MEANT TO BE USED AS "BANGS". IT IS NOT A FULL WIG. THE FRINGE IS VERY EASY TO USE, ALL YOU DO IS STYLE YOUR HAIR (IN DREAD FALLS, PIGTAILS, ETC) AND THEN CLIP THE FRINGE ON YOUR HEAD WHERE YOUR BANGS WOULD NORMALLY BE. SLIP ON A HEADBAND, SCARF, ETC TO COVER WHERE IT'S ATTACHED AND YOU'RE GOOD TO GO! INSTANT AWESOME HAIR! THE FRINGE DOES NOT COME ATTACHED TO THE HEADBAND SHOWN IN THE PHOTOS! THE HEADBAND IS A SEPARATE PIECE, AND IS NOT INCLUDED. IF YOU WOULD LIKE TO ORDER A SIMILAR HEADBAND, I DO SELL THEM AS WELL & DETAILS CAN BE FOUND BELOW. ALL FRINGES COME WITH CLIPS ATTACHED UNLESS OTHERWISE STATED. THE CLIPS ARE SMALL FLAT COMB STYLE "WIG CLIPS" WHICH ARE VERY SIMPLE TO USE, YOU JUST BEND THEM TO OPEN AND CLOSE. THEY WILL SECURELY HOLD THE HAIR PIECE IN PLACE ON YOUR HEAD, SO NO WORRIES ABOUT WEARING IT OUT DANCING... IT WONT BUDGE! PAYPAL ORDERS: IF YOU WOULD LIKE TO INCLUDE A WIDE BLACK HEADBAND WITH YOUR ORDER CLICK THE SKULL BELOW AND IT WILL BE ADDED TO YOUR CART! THE MEDIUM LENGTH FRINGE IS MY BASE LINE, AND I OFFER FOUR STYLES: LAYERED 2 COLOR, LAYERED 3 COLOR, REVERSIBLE, AND SOLID. THESE FRINGES ARE 12 INCHES LONG. MOST OF THE FRINGES I USE PERSONALLY ARE OF THE MEDIUM LENGTH VARIETY. THE LAYERED 2 COLOR FRINGE COMES IN MANY COLOR COMBINATIONS AND IS HIGHLY CUSTOMIZABLE. 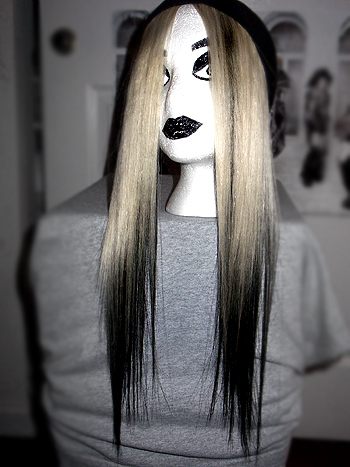 THE HAIR IS LAYERED SO THE BOTTOM COLOR "PEEKS OUT" OR DRAMATIC EFFECT! I HAVE LISTED SOME OF THE MORE POPULAR STYLES BELOW AVAILABLE FOR DIRECT PURCHASE. IF YOU'RE INTERESTED IN A CUSTOM ORDER, HEAD TO THE CUSTOM COMBINATION SECTION FOR DETAILS. LOOKING FOR SOMETHING MORE EXTREME? THERE ARE MANY OPTIONS BESIDES THE ONES I HAVE SHOWN ABOVE. DESIGN YOUR OWN! PICK FROM ANY TWO OF THESE COLORS: WHITE, BLACK, BLONDE, RED, PINK, PURPLE, BLUE, GREEN, & ORANGE FOR A CUSTOM DESIGNED PIECE! IF YOU ARE INTERESTED IN PLACING AN ORDER FOR A CUSTOM COLOR COMBINATION GO TO THE ORDERING PAGE FOR INSTRUCTIONS! SAME AS THE LAYERED 2 COLOR, WITH AN EXTRA COLOR ADDED IN! THESE ARE ALSO HIGHLY CUSTOMIZABLE, AND IF YOURE INTERESTED PUTTING TOGETHER A COLOR COMBINATION THAT I DONT HAVE LISTED HERE GO TO THE ORDERING PAGE FOR DETAILS! REVERSIBLE FRINGES ARE JUST THAT: REVERSIBLE! DESIGNED SO YOU CAN WEAR IT WITH EITHER COLOR ON TOP. TWO FRINGES IN ONE! BE BLONDE ONE DAY, AND PINK THE NEXT! THESE FRINGES ARE NOT LAYERED (BOTH COLORS ARE THE SAME LENGTH) AND DO NOT COME WITH CLIPS SO YOU WILL NEED A TIGHT HEADBAND TO HOLD IT IN PLACE. SOLID COLORS ARE ALSO AVAILABLE! 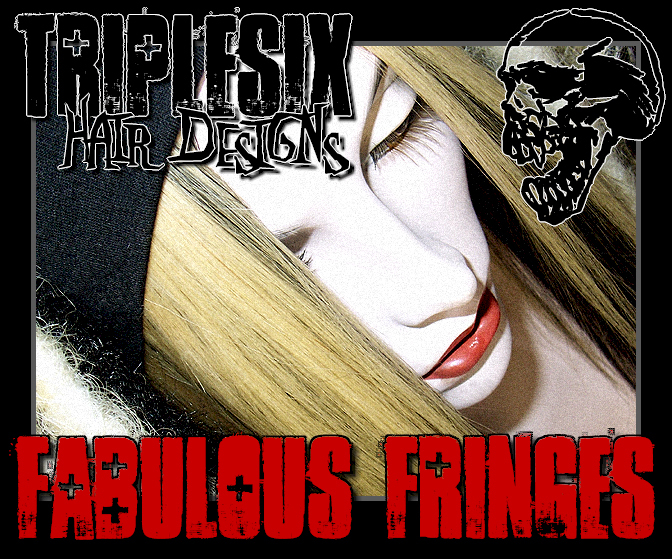 FOR THOSE OF YOU LOOKING FOR SUPER DRAMATIC LENGTH, THESE ARE THE FRINGES FOR YOU! AT 18 INCHES LONG THESE WILL DEFINITELY GET YOU NOTICED! I CAN DO ANY COMBINATION OF COLORS. SOME OF THE MORE POPULAR ONES ARE SHOWN BELOW. IF YOU'RE INTERESTED IN SOMETHING CUSTOM, EMAIL ME AND WE CAN WORK SOMETHING OUT!